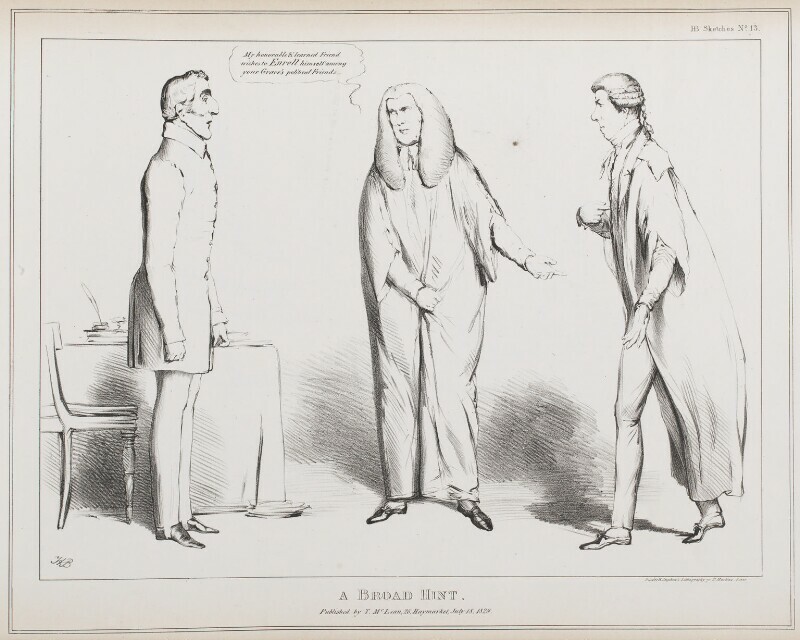 Henry Brougham, 1st Baron Brougham and Vaux (1778-1868), Lord Chancellor. Sitter associated with 259 portraits. John Singleton Copley, Baron Lyndhurst (1772-1863), Lord Chancellor and politician; son of the painter John Singleton Copley. Sitter associated with 95 portraits. Ducôte & Stephens (active 1829), Lithographic printers. Artist associated with 69 portraits. Metropolitan police force of over three thousand paid, uniformed, professional policemen founded by Home Secretary Sir Robert Peel. Roman Catholic Relief Act grants emancipation; Catholics admitted to vote, sit in parliament and hold almost all public offices. Success of George Stephenson's Rocket steam engine at Rainhill Trials. First London bus service licensed; the new 'box-on-wheels' contributes greatly to the expansion of the suburbs. Apsley House completed for the Duke of Wellington by Benjamin Wyatt. First Oxford and Cambridge boat race. Andrew Jackson is elected President of the United States.